Ok, so this is what I get for mixing with Picon Biere instead of the original Amer Picon. The two are not the same. 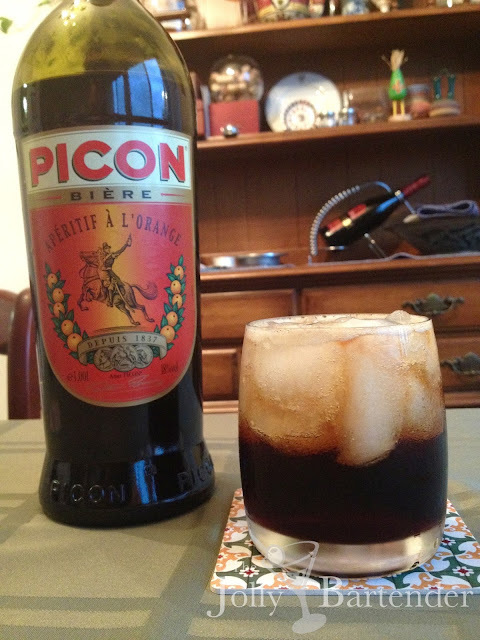 For one thing, the Biere is a sweeter liqueur and not the high-proof and hard to find Amer Picon. Picon Biere is also intended to be added to beer to change the character of those boring light lagers. I'll probably do this at some point, but I was curious how a Picon Biere Fizz would turn out. As it does turn out, I recommend against doing it. It is really dark, in flavor and color, and with a lot of root beer bitterness. There's quinine too, so it is like having a black tonic water without the gin. So kind of a sugary and watery blah. I should learn from this experience, but you can bet I will try another similar cocktail in the coming days just to say I did it...again. Build drink in a highball glass with ice and stir. Top with club soda.